Despite the fact that in the fifties the so-called Cold War was going on were in the Netherlands and elsewhere in Europe Soviet ships built or repaired. One of the most remarkable ships was the Kommuna. The contract for the extensive repairs with the Machinoimport, Moscow. was signed on 13 April 1950 (order no. 517). She arrived on 1 June and delivered 8 (elsewhere is reported the 30th) July 1951. She was docked between 5 July-31 August 1950 and 3 October 1950-17 February 1951 with engine trials on 7 and 22 June1951 and technical trial on 28 and 29 June 1951. The Russian tugs Antej and Apollo assisted by her departure on 15 July 1951 back to Libau. Supervisors during the rebuilding were Zbaikov, Sergueev, Eremine and Gertsueev. Het displacement was 3,140 tons, a gross tonnage of 686 tons and the dimensions 96 x 18,7 x4,63 metres. The engines supplied 1,200 hp allowing a speed of 9 knots. Her master at arrival was Smirnoff. 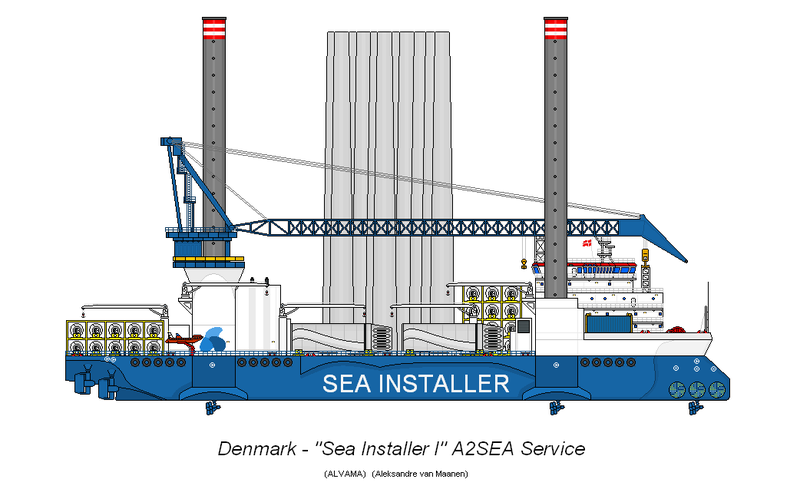 Despite what some sources claimed was she not built at the shipyard De Schelde in the Netherlands. (1) In 1912 was she laid down at the Putilov Yard as the Volkov and launched on 17/30 November 1913 and commissioned in the Russian Imperial navy on 14 July 1915. On 31 December 1922 she received her final name Kommuna. 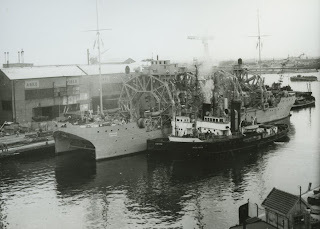 The newspaper Provinciale Zeeuwse Courant dated Monday 5 June 1950 wrote that the Russian submarine salvage vessel Kommuna was being repaired by the shipyard of the Kon. Mij. De Schelde. She was described as an uncommon ship with two hulls within a sunken submarine could be raised. Despite her dimensions were not extreme was her crew quite large with around thirty officers and seventy sailors. According to tidings returned her captain and 66 men on Sunday morning with the Sebastopol. The edition dated 29 June 1951 reported that she had a day earlier her first trial after extensive repairs included partly renewal of the decks, bottom and hulls and rebuilding cabins and accommodations. The engine rooms were equipped with two Werkspoor diesels for the propulsion and two Schelde Sulzer engines for the salvage equipment. Another Dutch firm Arnhemse Stoomsleephelling supplied a steam boiler for the heating. 1. In contrary to the similar Italian Anteo (at Schiedam) and the Spanish Kangeru (at Haarlem). 2. The newspaper Zeeuwsch Dagblad dated Saturday 30 June 1951 reported that she left the locks on Thursday for her trials and that this strange vessel was a former German repair shop. The newspaper Provinciale Zeeuwse Courant dated 12 January 1952 referred to the newspaper De Stem which reported that she sunk during a voyage on the Baltic during heavy weather when she lost contact with the tugs which were towing her. Russian authorities in the Netherlands did not confirm this tiding. The Kommuna is nowadays still in service!